The sports world was an oasis during an otherwise terrible year. It is widely accepted that 2016 has been the most vile year in memory—a train wreck contained inside the world’s biggest dumpster fire. But amid the swirl of venom, political excrement, and personal tears, it is worth savoring the fact that, in the world of sports, tragedy has not been the defining characteristic. On the field, the sports world has been an oasis of uplifting escape. And off the field, allegedly apolitical players have charted a high-profile path of resistance that our normal political channels have failed miserably to articulate. Between the lines, this year will always be remembered for the numbers 3-1 and the way those digits became the prologue for two of the most epic comebacks in sports history. Two curses were broken by two long-suffering teams in two Midwestern cities leading to two parades that were less celebrations of championships than they were celebrations of community. I’m of course talking about the NBA’s Cleveland Cavaliers and Major League Baseball’s Chicago Cubs. The Cavs were the first team to ever come back from a 3-1 deficit in the NBA Finals, and they did it while competing only against the Golden State Warriors, the greatest regular-season team in the history of the NBA. Facilitating this miracle was LeBron James, who led both teams in points, rebounds, assists, blocks, and steals: the most remarkable one-person performance, for my money, in NBA history. The Cubs saw the Cavs’ drama and raised them, not least of all by beating the Cleveland Indians in the process. Even those of us distraught about all this year took from us had to feel a buzzy joy at the site of Cubs third-baseman Kris Bryant grinning as he fielded the final out of the Series, and then throw the ball as his feet slipped underneath him on the wet field. (This does not apply to Cleveland baseball fans.) That was the cap on what was the greatest game seven in the history of sports possibly just edging out the very game seven that the Cavs needed to beat the Warriors. Cleveland, after winning the city’s first title in any sport since 1964, gave us a victory parade with more people—1.3 million—than the entire population of the city itself. Chicago Cubs fans, celebrating their first title since Mark Twain was a working writer, gathered 5.5 million for the Cubbies, the seventh-largest gathering of humans in world history. But the on-field miracles weren’t just found in those two series. This year also gave us the greatest WNBA finals in history between the Minnesota Lynx and Los Angeles Sparks, coming down to the last possession. The 2016 Rio Olympics burnished the legends of Usain Bolt and Michael Phelps. They also showcased the futuristic artistry of gymnast Simone Biles; the groundbreaking swimming of Katie Ledecky and Simone Manuel; and the unbelievable performance from swimmer Anthony Ervin, who won gold in the 50m, 16 years after his last gold medal. And I said I don’t want to be on that side of history. I want to stand up for principles and I want to live and die with a free conscience and a free soul whether anybody likes it or not. I’m not always going to be right, I’m not always going to be eloquent, but I’m always going to try my best to stand up for what’s right and what’s just, whether people like it or not and so I began that process and that’s where it’s taken me and I don’t have any regrets. Despite all of the backlash and all of the setbacks, a setback ain’t nothing but a setup to a comeback. 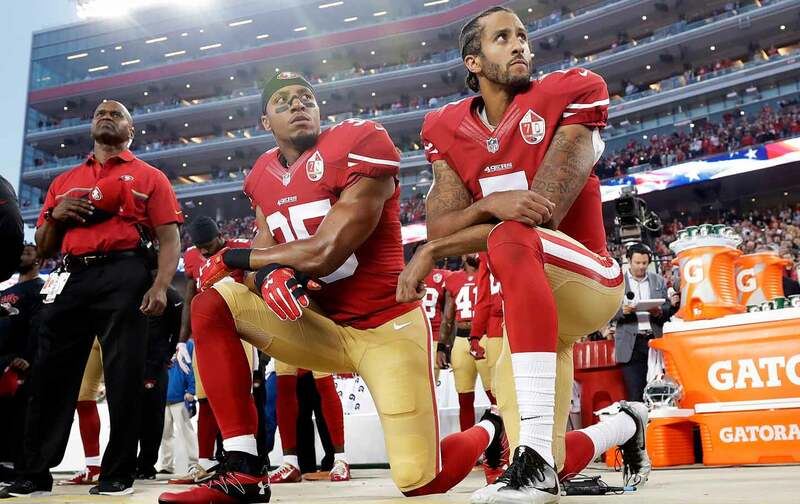 This year was a setback, but there were also powerful moments of resistance on and off the field. It’s comeback time in 2017.